A native of Lakewood, New Jersey, Jordan Seda’s first introduction to the power of physical therapy came not as a graduate student, but as a patient. As a three-sport varsity letterman who struggled with ankle issues, he spent a lot of time in the athletic trainer’s office. “Once I realized how skilled, therapeutic care allowed me to continue to perform at a high level, I grew inspired to pursue a career in physical therapy” he says. He received his Bachelor of Science degree in Exercise Science and Sport Studies from Rutgers University, eventually earning his Doctorate in Physical Therapy from Columbia University. These areas of study proved to be the melding of two passions, biomechanics and orthopedic therapies. “They gave me the tools to understand how the body moves, why it moves the way it does and the best ways to keep it all moving at an optimum level” he says. Jordan actively strives to have as heavy a caseload as possible. He enjoys the excitement of treating patients at all levels, from all walks of life, and says the exposure makes him a better doctor. He further adds that “from infant-specific orthopedic disorders to geriatric acute care, I enjoy the challenge of solving complex cases.” A self-described foodie who’s always had a passion for travel, he completed internships at Athletico Physical Therapy in Chicago, the Sharp Rees-Stealy Medical Center in San Diego and several NYC based clinics. He has also gone on to complete Functional Mobilization I through the Institute of Physical Art. Marina Yerovinkina earned her Doctorate in Physical Therapy with Honors from Columbia University, where she completed the Advanced Track in Orthopedics and was introduced to the world of dance medicine. Prior to discovering physical therapy, Marina explored different avenues, which included earning a BA in Environmental studies from NYU. Her background in Dance, however, followed by the study of Martial Arts, inevitably cultivated an ardor for the study of physical movement. Through ballet and modern dance she developed an awareness of her own body, and the myriad of ways it can move. Aikido in turn, – Marina’s first martial art of choice – contributed a growing understanding of how to affect the movements of others. Together, these were a springboard to a professional commitment to helping patients become more attuned to their own bodies. Integrating all of her experience, she believes that helping patients understand their injury better on an intellectual level enables them to avoid recurrence, leading to long term physical health. Marina’s mission is clear: to show people how they can regain control over their body. So the payoff comes when a patient integrates the information they learned the previous session, and applies that knowledge to their own body. They are physically and mentally engaged in their own health transformation. These days Marina continues to practice Aikido, but tries to branch out and continue adding to her repertoire of movement through other activities such as rock climbing, snowboarding, kickboxing and more. Eldin Trebincevic is experienced in developing comprehensive plans of care for patients that incorporate manual techniques and direct interventions in coordination with various members of a patient’s support team, including family members and other healthcare professionals. Whenever indicated, he incorporates manual therapy as much as possible into his treatment approach. Eldin earned his Doctorate of Physical Therapy from the State University of New York at Stony Brook after completing Bachelor degrees in Health Science and Biology from the university. Throughout his educational and professional career, Eldin gained valuable clinical experience at a number of hospitals, rehabilitation clinics and private practices within the metropolitan New York area, including New York Presbyterian Hospital, Bellevue Hospital, Long Island Jewish Medical Center, Long Island State Veterans Home, Manhattan Physical Medicine & Rehabilitation, Outreach Physical Therapy and the Center for Rehabilitation in Flushing. In addition to his extensive clinical experience as a staff physical therapist in acute care, rehabilitation and outpatient placement, Eldin maintains a steadfast commitment to continuing education, earning numerous professional certifications and adding to his level of expertise. He has attended seminars and classes on topics ranging from myofascial release, the Mulligan concept and the Maitland-Australian method to advanced techniques covering the shoulder, elbow, hand and knee, among others. Eldin has also spent time interviewing and evaluating candidates for the Doctorate of Physical Therapy program at SUNY Stony Brook. In his free time, Eldin enjoys spending time at the gym, watching soccer, traveling and being with friends. Warren Hamlet has over 15 years of clinical experience in orthopedics and sports medicine, starting his career as an athletic trainer. 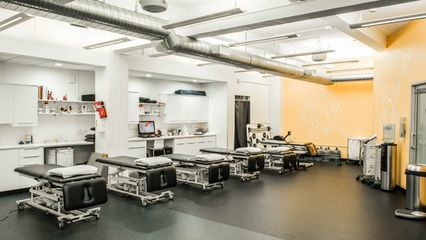 Warren and his team excel in combining skilled manual treatment with aggressive strength and conditioning exercises specifically designed for each individual patient, in order for them to achieve their functional goals. His approach facilitates a quick and comprehensive return to the activity, sport or lifestyle each individual deserves. He is a graduate of Long Island University with a Doctorate in Physical Therapy, and an undergraduate degree in psychology from New York University. In addition to be a NYS licensed Physical Therapist, he is also a NATA Certified Athletic Trainer, and a NSCA Certified Strength and Conditioning Specialist. Warren was the President and Owner of All Seasons Orthopedics and Sports Physical Therapy for the past 9 years, with offices in midtown Manhattan and Park Slope, Brooklyn. Warren’s practice placed a priority on individual attention, performing a comprehensive evaluation of each patient to identify their underlying symptoms and functional limitations. Using state of the art technology, each patient received the most innovative treatment specifically designed for them. Lee Scantalides combines lifelong experience as a martial artist with his education as a movement specialist to develop and implement successful rehabilitation programs. He utilizes manual therapeutic techniques and neuromuscular re-education, in conjunction with individualized strength training, to restore patients’ wellness, allowing them to return to sporting activities, duties at work, and overall well-being. Lee received his Doctorate of Physical Therapy from Touro College and was the recipient of the Research Achievement Award for exemplary performance. Lee is continuing his manual therapy education, studying for his level I and II manual certification. He is also a teaching assistant at Touro College for their DPT program. He is certified through the National Strength and Conditioning Association as a Certified Strength and Conditioning Specialist and as a Certified Personal Trainer. He is also a member of the American Physical Therapy Association and the NSCA. In 2005, Lee started his own personal training and coaching business. He also teaches programs on musculoskeletal pathologies and safe stretching protocols to trainers at Equinox Fitness Clubs and New York Sports Club. Lee has also successfully completed StrongFirst Kettlebell instructor certification. To expand his martial arts skills, Lee has been training in Muay Thai kickboxing and was recently promoted to Elite level sparring. He has earned his 4th Dan (degree) black belt in Taekwondo, ranking him as a Master. Lee has trained in Uechi-Ryu Karate and Small Circle Japanese Ju-Jitsu since age six. Julie Ehrlich believes in the power of personalized manual therapy and therapeutic exercise to ensure an effective and efficient return from injury. She values her relationships with patients and is dedicated to working with them from the time of injury to their return to a higher level of function. Her goal is to provide tangible results of progress as quickly as possible by implementing evidence-based techniques and exercises. Julie’s interest in physical therapy stems from her participation in a two day bike ride to raise funds for wounded military veterans. She was inspired by these men and women, observing their persistent hard work, optimistic outlooks and refusal to give up. This led her to research projects strengthening protocols for individuals with lower extremity amputations. Julie earned her Doctor of Physical Therapy degree from Columbia University specializing in orthopedic rehabilitation. During her time there, she volunteered at the university’s pro bono medical clinic, as well as participated in a service trip to Guatemala where she treated patients, educated students and helped build wheelchairs for those in need. She has also had clinical affiliations with several professional baseball teams where she became skilled in on-the-field assessments and taking an athlete through rehab from acute injury to re-entering the game. With her background in sports, she understands that physical therapy does not end when the injury has healed. It takes patience and cooperation to rehab past the point of injury, to prevent recurrence.